As summer is approaching, you’re probably preparing for vacations, kid’s camps, and other important activities. Summertime is an incredibly fun time for the entire family, but it can make it difficult to prepare dinner for your family. Instead of driving through a fast-food joint or eating a late-night bowl of cereal, order a delicious and healthy dinner on Restaurant Connection’s website for your entire family! By the time you get home, our food delivery service will deliver your dinner right to your front door and everyone will be fed with the simple click of a mouse! You’ll also be able to choose from an amazing selection of local and chain restaurants here in Troy, Michigan. Browse our website now for a complete list of all of the restaurants we offer, and order dinner today! Days spent at the pool, the baseball field, the park, and the myriad of other things that your family is interested in can mean that you’re getting home late. Don’t let your family fend for themselves. Use our easy website and order an incredible dinner for everyone, finish your todo list for the day, and then have a hot and fresh dinner delivered to your door that your entire family will enjoy! It will save the day and make you happy to serve your family a fulfilling and delicious meal. You can even set up the delivery to be at your home as soon as you arrive home so your hungry and tired family will be full. If you have a picky bunch of family members, Restaurant Connection will save the day when no one can agree on one type of meal or restaurant. If you’re arriving home from a crazy day and don’t want to assume the position of a short-order cook, browse Restaurant Connection’s website with your kiddos and spouse so everyone can pick what they would prefer and then you can choose what you would like as well. It will be delivered in as little as an hour, and you’ll have dinner for everyone in your family. No one will be disappointed in their meal, and you won’t have to deal with cranky kids who won’t eat or a spouse who chooses a peanut butter and jelly sandwich instead. 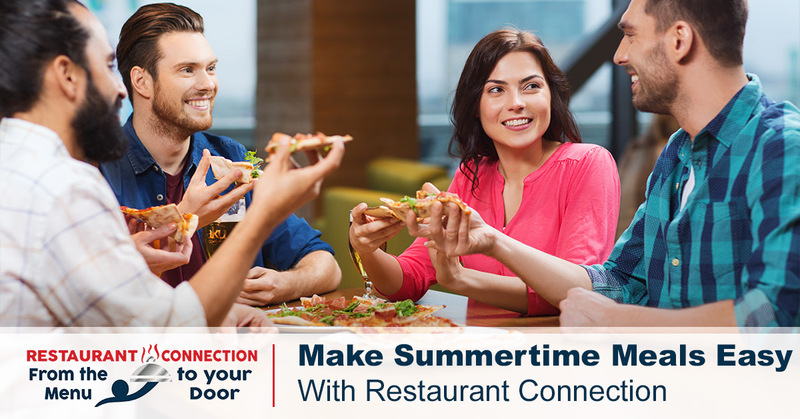 Restaurant Connection has a huge array of amazing local and chain restaurants for you and your family to browse through, and with our quick food delivery service, you’ll be able to pick out dinner and have a happy and full family. Being stressed out is never fun, and while summer is a time full of fun and excitement, it can be packed with activities. Trying to squeeze enough time into your day to go to the grocery story, devise a meal plan, prepare the food, and then cook it can almost end up being a full-time job. On those days when you just can’t make it home in time, Restaurant Connection is there for you. You can even order dinner at work and by the time you’re home, you’ll be answering the door to a fresh and delicious dinner. You can spend time with your family and hear about their day instead of rushing around your kitchen trying to throw something together. Enjoy the time you have with your children and spouse and order your next family meal from Restaurant Connection! Summer is a wonderful time full of memories, warm weather, and time spent with your family. If you’re finding yourself needing a great idea for dinner in Troy, Michigan, head on over to Restaurant Connection’s website and use our food delivery service today!